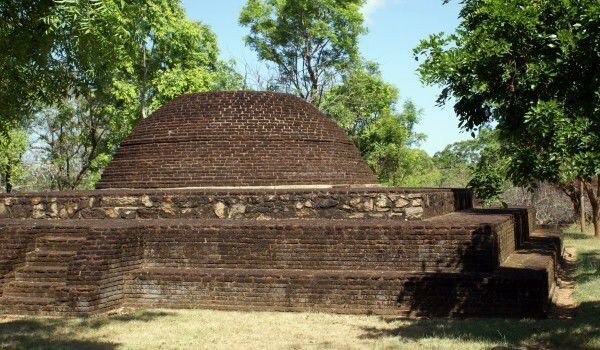 Polonnaruwa is the second largest and most important historical ancient city and a monument of Sri Lanka. This is the second capital of the country (after Anuradhapura) and is located in the central part of northern Sri Lanka, the current capital Colombo is located 216 km away. Polonnaruwa became the central headquarters of the empire of king Vijayabahu after the fall of Anuradhapura in the 11th century. The village previously served as a provincial recreation residence of the rulers. For only two centuries, the city retains its status as a major center of Sri Lanka. Its location is strategic, it is situated along the river Mahaveli. The most interesting monuments that survive today are the Brahman monuments and a uniquely beautiful city garden. One advantage of the quaint village is that most archaeological sites are located in a compact area and can quickly and easily be seen. Particularly impressive are the Brahman monuments that represent horizontal and vertical Buddha statues. Here you can see the unique stone sculpture of the Reclining Buddha at temple of Gal Vihar. Besides these statues, it is good to see the monumental ruins of the marvelous city-garden, which was built in the twelfth century by Lord Parakramabahu the lst. In addition to the wonderful gardens, the ruler is credited with building the artificial lake Parakrama, which impresses with its master irrigation system. It stored water for irrigation in a distance of 2 400 hectares, and still exists today. The main Palace of Parakramabahu is located at the Royal Citadel, along with several smaller office buildings. Made entirely of stone, the castle is surrounded by a one meter firewall and is distinguished by its intricate architecture. Before the fortification wall are the Lotus, or Royal Baths. For tourists here, it is not recommended to eat food that is prepared on street markets and kiosks. It is best to eat it in small restaurants that store chilled food.